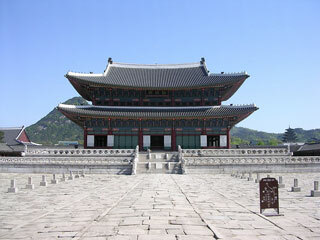 Gyeongbokgung also known as Gyeongbokgung Palace or Gyeongbok Palace, was the main royal palace of the Joseon dynasty. Built in 1395, it is located in northern Seoul, South Korea. The largest of the Five Grand Palaces built by the Joseon dynasty, Gyeongbokgung served as the home of Kings of the Joseon dynasty, the Kings' households, as well as the government of Joseon. This article uses material from the Wikipedia article "Gyeongbokgung", which is released under the Creative Commons Attribution-Share-Alike 3.0 License.